CARBONDALE, Ill. -- Sometimes a simple act can have a far-reaching impact. Tilden “Tim” Parks ‘76 remembers well the day his father took him to his first SIU basketball game. Today, this SIU fan is adding to his long-time support by donating an additional $1.3 million to Southern Illinois University Carbondale to provide scholarships for future Salukis. Parks’ estate gift will be divided into three parts -- $515,000 for journalism, $515,000 for SIU Athletics, and $270,000 for Morris Library. All of the funds will be designated for undergraduate student scholarships. Parks’ affinity for SIU Athletics is evident in his attendance record for football and basketball games. 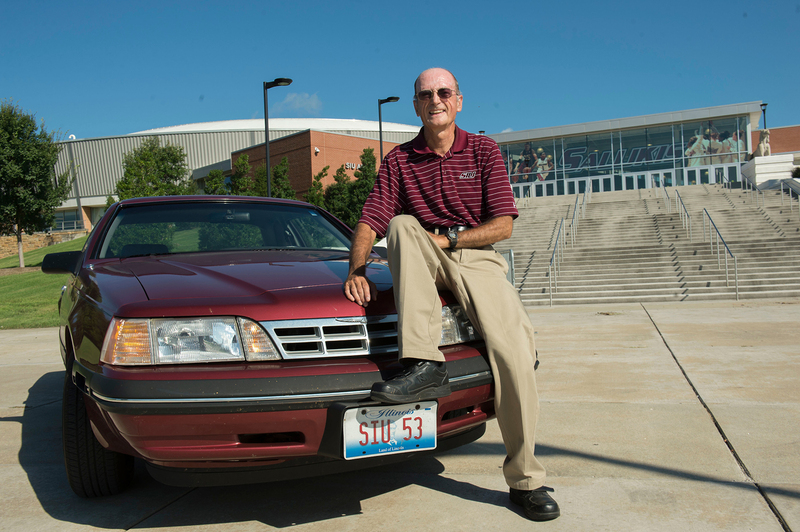 Parks officially started keeping track of his Saluki sports attendance in 1978, and he’s proud to share that his unblemished attendance streak stands at 218 home football games and 540 men’s home basketball games. “Tim's extraordinary gift is matched only by his incredible loyalty to the Salukis,” Director of Athletics Tommy Bell said. “His generosity will benefit student-athletes for generations to come." Parks earned a degree in journalism and worked in Morris Library as a student. “At a time when the journalism profession is under stress, it is reassuring when an alum such as Tim Parks makes such a substantial gift to educate the next generation of journalists,” said Kavita Karan, professor and interim director of the School of Journalism. Morris Library holds a special place in Parks’ heart, as well. As an undergraduate, Parks loved getting lost in the stacks at Morris Library, discovering unexpected treasures and helping patrons find the exact book or magazine they were searching for. Library Dean John Pollitz recalls that Parks worked on the third floor of the library as a student employee in the 1970s. Parks worked for Pollitz’s wife, Aracely Pollitz, who was the Morris Library student supervisor at the time. “I believe we are put on this earth to help one another. This gift is allowing me to do just that. I want to help students who are passionate in their education and help them achieve their dreams,” Parks said. The Tilden Parks Family Scholarship was made in conjunction with the Forever SIU fundraising campaign, to advance the university’s goal of providing the best education possible to students of all disciplines. More information about the campaign is available at foreversiu.org.